Not Exactly A Boxing Capital, Kabul Stages A Championship Bout : The Two-Way Afghanistan's own Hamid Rahimi takes a World Boxing crown in a rare bout held in Kabul. 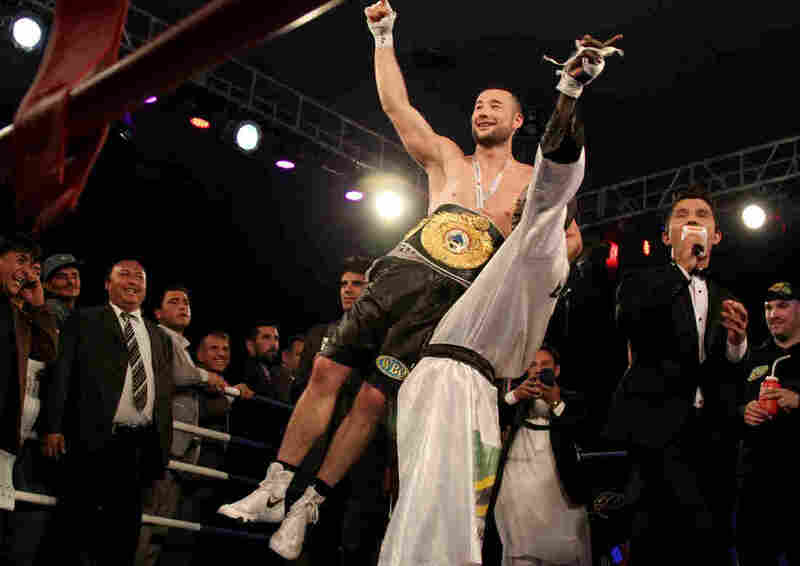 Kabul native Hamid Rahimi defeated Tanzania's Said Mbelwa by technical knockout in the seventh round on Tuesday to claim the World Boxing Organization's Intercontinental Middleweight Championship before an enthusiastic crowd in the Afghan capital. It wasn't Caesar's Palace. It was the Loya Jirga Hall at Kabul Polytechnic University -– a building where Afghanistan's elders gather to discuss matters of national importance. But for one night, there was boxing with all the hype of Las Vegas –- minus the showgirls. The star attraction was Kabul native Hamid Rahimi, 29, who has spent most of his life in Germany and is a celebrated middleweight boxer. He became the World Boxing Union champion earlier this year. After years of working to hold a fight in Kabul, his dream came true Tuesday. Rahimi said the event was to celebrate Afghanistan's athletes and to send a message of peace to the world. The "Fight 4 Peace" was held to fill the World Boxing Organization's vacant intercontinental middleweight title. It was hardly peaceful getting into the hall. Fans paid at average of $100 each (a monthly salary in Kabul might be only $200 to $300). The crowd was told the event would start at 7 p.m., and hundreds lined up outside the gates. But at 7, after some people had entered, police and security officials closed the gates. The crowd kept massing and pressed closer to the gate. Tensions flared. There was pushing and shoving initially. Then things got ugly. Police started swinging batons and pushing the crowd back. A mass of people were forced up against a chain-link fence that fortunately gave way and allowed the men to spill over into an adjacent lot. At that point, police drove a pickup truck armed with a heavy machine gun into the crowd to force them back. Eventually things calmed down and police started letting people in. Catastrophe averted. Inside, amped-up TV presenters spoke in Dari and Pashto -– the two languages of Afghanistan –- and shouted to the crowd that the event was being broadcast live in 52 countries (unconfirmed). A mullah delivered a prayer and blessing of the event. The first warm-up act featured a young man juggle soccer balls while loud music blared. Then, two male pop singers took turns badly lip-syncing patriotic tunes. It had the energy of a Vegas event, but was done Afghan-style -– wholesome, completely devoid of women and a bit unorganized. After a quick display of martial arts and kickboxing, the main event began. For six rounds, Rahimi and his Tanzanian opponent Said Mbelwa shuffled around the ring, landing few punches of substance. Mbelwa often took to dancing and gesticulating -– a touch of Muhammad Ali, though without the heft to back it up. Between rounds, a man wearing cargo pants and a black T-shirt paraded around the ring with placards displaying the round number. In the seventh round, the two fighters exchanged a few blows and suddenly Mbelwa pulled away, grabbing his shoulder in pain. It wasn't clear whether he took a punch or was injured while throwing one. As fights go, it was a dud. But the crowd still went nuts. Riot police had to encircle the ring to prevent rabid fans from jumping in to celebrate. Eventually, security calmed things down and the boxing officials presented Rahimi with his WBO champion's belt. The event was billed as the first professional fight in Afghanistan, and it reflected the nature of things in the country: It was passionate and proud, if unorganized and teetering on the brink of violence.